Ask any entrepreneur and she will tell you that growing your business in a complex business environment holds many more challenges that ever before. Prospects are more informed, demanding and control the process to a large extent. There are more decision makers to deal with who require a consensus to make decisions. Organizational structures are more gated and difficult to penetrate. Buyers expect sales people to bring value to the selling process before they sell their solutions. If you’re following a sales process that worked several years ago, it won’t work today. That’s what our research tells along with what we hear in our interaction with buyers. You see, there’s been a fundamental shift in the way prospects buy. The fastest path to sales growth is through a team of top-performing salespeople. Salespeople who can tackle these challenges. Salespeople who are truly “customer/client fluent.” They know who the prospect/customer/client is, what problems they face, and how to help. So how do you build top performers who connect with prospects and meet these challenges head-on? A sales person’s ability to provide perspective is, in my opinion, the defining differentiator. Perspective is the polar opposite of a scripted canned pitch. Prospects want to deal with sales people who focus beyond the sale all the way to the result they want to achieve. It’s about truly using a collaborative process banded with a solution to solve discussions of value rather than falling back on a reliable product discussion. 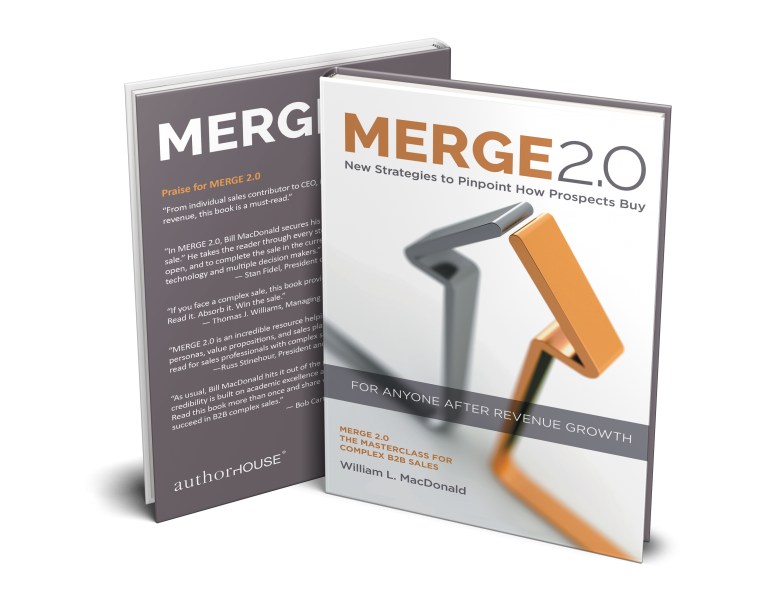 I typically see that even experienced salespeople have a tendency to go quickly to a product discussion. It seems natural. You identify a problem and based on your knowledge and experience, you then show the prospect a solution. It most cases, this is what stalls the sales process. You moved too fast for the pace of the buyer’s thinking and his buying process. Perspective, then, is taking what you know, think, and experience and using it to create your own distinctive point of view. It’s converting input into insight. It’s being smart about the decision that has to be made in every interpersonal interaction. Perspective is the insight to know when to do what, that brings perspective to the process. It’s the ability get the prospect to take a step back, and to bring up overlooked problems and propose solutions that the prospect has yet to consider. Good sales people initiate great conversations around issues the prospect faces but has yet to quantify or think through his possible solutions. The value of the sales rep’s insight and his sharing of new concepts and ideas will help fix, accomplish or avoid issues the prospect doesn’t see. It’s not the quality of your product or service that wins, but the quality of the insight you deliver as part of the sale itself. And the best reps don’t win by discussing solutions the prospect has already considered, but rather by finding solutions others have overlooked. Understand the prospect’s concept or vision of a solution, take ownership for it, and share unique insight─Perspective─then help them make it happen. Get creative. Think outside the box. Simply put, sales people must be engaged through the prospect’s organizational strategy and equipped to achieve results. When sales people follow a process, they intuitively focus on the prospect’s problems and immediately begin by understanding the situation and possible solutions. The more knowledgeable the sales person is about his solutions, the more apt he is to jump in too soon with a solution before the prospect has created a concept for a solution and has decided he wants to do something about it. I received lots of comments on a recent blogpost, entitled “Sell me this Pen.” This is a good example of how sales people, when asked, “Sell me this pen,” have a tendency to start with the product’s features and benefits, rather than begin with an understanding of how and why the prospect needs a pen, what they will use it for and how it might help them fix, accomplish or avoid something that’s an issue. In the blog, I give an example of how you need to get the prospect to step back and how you need to help them create a vision or concept of a solution where the pen could be a fit. As we’ve discussed many times, selling has changed. Buyers have more sources of information, there are more people involved, and there is a more structured process─all of which make buying a complex, often chaotic, political endeavor. Sales people are no longer valued for providing product specs and pricing. A salesperson’s value today is defined differently. Prospects look for something they can’t get online, from automated systems, or from uninformed salespeople. 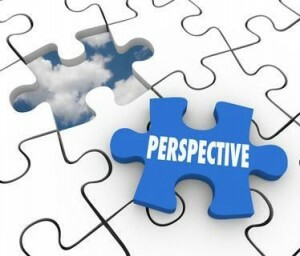 Perspective selling offers prospects something they can’t get anywhere else. When all is said and done, only a salesperson’s integrity, patience, and problem-solving abilities can earn the trust required to carry the day. A traditional consultative selling approach can fall short in a complex account. 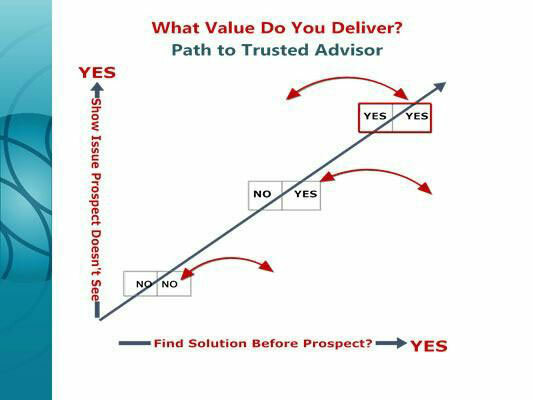 The danger for salespeople, as illustrated in the chart above, is that if they focus solely on identifying a need and then positioning a solution to meet that need (usually no different than what others are presenting), buyers will detect a lack of perspective and lose trust. There will not be the type of connection that allows the relationship to mature into a true partnership where the salesperson is seen as a trusted advisor. Selling requires a business-focused, buyer-centric relationship, one in which the salesperson provides value-added perspective. Buyers will be receptive to listen to your point of view when you proceed from a fact-based standpoint. When you provide prospects with data about their situation, it not only proves the case you are proposing but allows the prospect to predict his results going forward. They do not believe the solution you are proposing will work. To overcome this, the salesperson needs to be able to provide specific research that backs up her position and shows the prospect the direction that others have already taken and used to achieve predictable success. It is not just research that is needed: sellers need to bring the lessons learned and experiences from other clients so that they can help new clients avoid unintended consequences. A point of view without proof is hollow. Not only will your prospect ask, “So what?”, they will quickly follow that with “Prove it!” The correct responses are critical. Perspective selling sounds basic to all of us, but it is a defining differentiator in the marketplace.